From British politician/author Hattersley (Buster’s Diaries, 2000, etc. ): a biography of Methodism’s founder regrettably lacking in the “enthusiasm” that made his evangelical sect the most dynamic faith in 18th-century England. John Wesley (1703–91) was not alone in feeling there was something essential missing in the anemic brand of Protestantism offered by the complacent, corrupt Church of England. The Holy Club established by his younger brother Charles at Oxford, which John joined in 1729, was one of many small religious societies whose members sought a more active and committed spiritual life. Methodism (so called because the members believed in systematic exercises of piety) became a national movement because John Wesley’s emphasis on an ecstatic moment of conversion and a personal relationship with God spoke powerfully to people neglected by the established church, especially poor people. But Hattersley has little interest in the qualities that sparked tumultuous mass response when, in 1739 Wesley began reluctantly preaching in fields; he calls fellow Methodist George Whitefield a better orator and suggests Whitefield would have been a better leader. 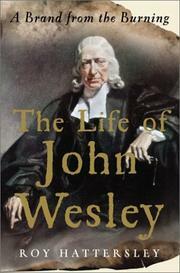 The author stresses Wesley’s constant doctrinal shifts, most of which will be incomprehensible to modern readers not versed in theological history, and his equally vacillating relationships with women to paint an unflattering portrait of a man who frequently changed his mind and then insisted he’d believed the same thing all along. This makes it difficult to appreciate Methodism’s enormous impact on English society and culture, or to have much interest in Wesley himself. Lengthy discussions of debates over Methodism’s organizational structure and its uneasy relationship with the Church of England, from which it did not officially separate until after Wesley’s death, are certainly necessary but not written in a manner likely to engage the general reader. Hattersley’s joint biography of Salvation Army founders William and Catherine Booth (Blood and Fire, 2000) did a much better job of intertwining psychological, religious, and social issues in a more compelling narrative. Conveys the facts, but little else.